Hey everyone. Hope you are looking forward to a good weekend. I have family in from out of town and we are throwing a party at my place tomorrow! Should be fun :) WHAT should I put on my nails? So today I have another Indie line to show you. Naild' It is a new brand for me. These are the first three I've tried. 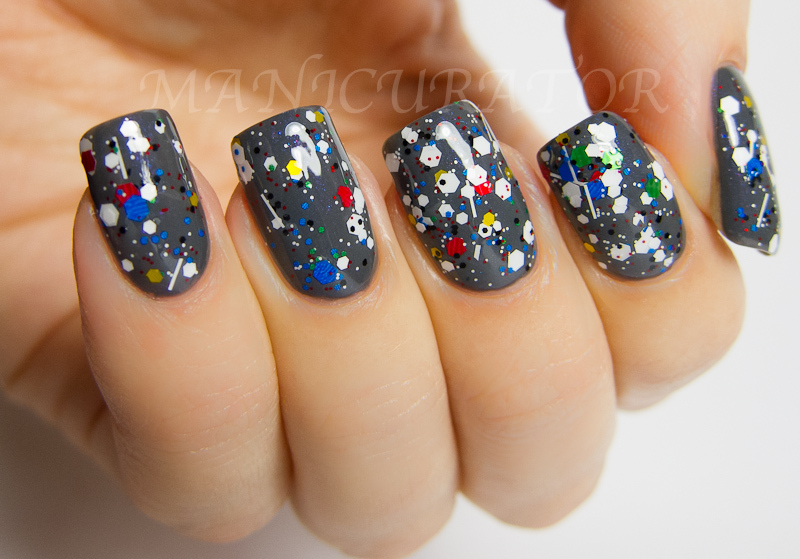 I certainly agree with the "Unique" in this polish name and I'm loving the labels! You can find her on Facebook and shop at Llarowe.com. Let's take a look! Naild' It Unique Nail Polish Cha Cha CheckMate, Olympic Rings and Candy Wrapper. Cha Cha CheckMate is a neon pink jelly base with a variety of black and white squares and hexes.I actually can't believe how cool this neon pink jelly is and how EASY it was to apply. I've got two coats on here, with Poshe top coat. Personally, I don't care for the super large squares. I know many will find that super unique so that is great. I think the polish would be perfect without the huge ones though. Olympic Rings is packed with glitter, full of all the olympic flag colors. White, green, red, yellow, blue, and a hint of black. This polish looks great layered and I have a feeling it would be opaque in 2 -3 coats. It's that glittery! I've got 1 coat on here, over Contrary Purple Smoke (which I will show you in my next post!) and Poshe top coat. Candy Wrapper surprised me. 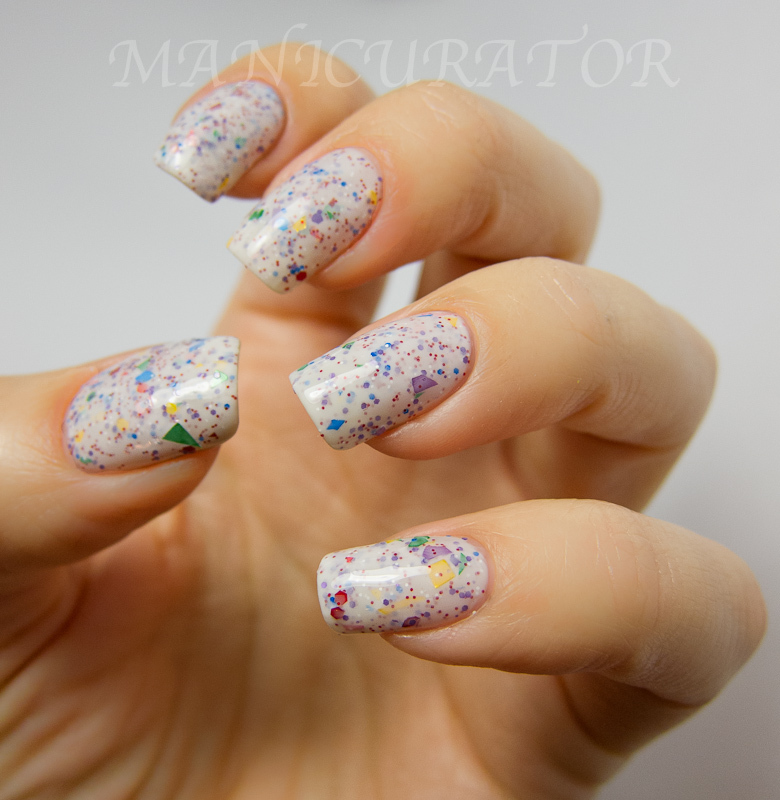 It's a white cream/jelly polish with multi colored shards and hex glitters in a variety of sizes. I have so many white based polishes but this is the first (I own) that combines hexes and shards. I didn't expect to like it as I'm not a shard person but this looks neat :D I have on 2 coats here and Poshe top coat. Very easy to apply, great formula. The pink one! It looks yummy, like a party treat! ChaCha Checkmate for me!. It is good for BCA month too. I have been a long-time fan of her polishes! My favorite of these is Cha Cha Checkmate. I have been wanting that one awhile! Really loving Olympic Rings! But these are all great! I am constantly amazed by your pics! These are beautiful polishes. If only I could catch up on my mainstream lines...I could have some time to give the Indie Polishes the credit they're due! Wow, I definitely need Cha Cha Checkmate in my life! I like candy wrapper it is reminiscent of KB Shimmer's Oh Splat, which I adore. These are some pretty polishes! The last two are very cool! Wow! These are all awesome, but I LOVE ChaCha Checkmate. That jelly is amazing! !